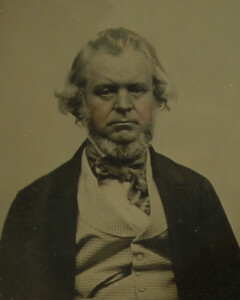 Andover rubber manufacturer Henry G. Tyer (1812–1881) was a man on the way up in 1861. An English emigrant who had received some training in New Jersey, Tyer had, in 1856, opened a small Ballardvale factory for the manufacture of rubber cement. By the outbreak of the war, he had begun to produce rubber overshoes as well, and had, in 1859, moved the business to larger premises on North Main Street (now the site of the Andover Safety Center). He lived with his wife Elizabeth and seven children in a handsome house on Andover’s Salem Street, and was chosen to serve on the town’s second “Committee of Twenty-five” in August 1862. The couple’s oldest son, Horace H, was seventeen years old in 1863, and thus a year too young to be eligible for the 1863 draft registration. After the war, the business capitalized on Tyer’s earlier patents for combining zinc oxide with rubber, and began to produce surgical and pharmaceutical products such as syringes and bulbs under the “Tyrian” trademark. After Tyer’s death in 1881, the business passed to son Horace, who built the large steam-powered factory on Railroad Street and carried his father’s legacy of invention and innovation into the twentieth century.